Looking Glass is the nickname for the Airborne Command Post, which was implemented by the U.S. Strategic Air Command (SAC) during the Cold War to ensure that operations would continue in the event that the primary strategic command centers were rendered unusable. The name "Looking Glass" derives from the fact that the aircraft used are equipped to fulfill, or "mirror" all functions normally performed on the ground. In the initial phase of the mission, anticipating possible military aggression by the Soviet Union, SAC had an EC-135 aircraft aloft 24 hours a day, seven days a week. After 1990, as that threat seemed to subside, the continuous flights were discontinued. However, the Looking Glass mission continues with a fleet of highly sophisticated aircraft that may be launched as needed. The birth of Looking Glass. Whereas many people in the second half of the twentieth century envisioned scenarios of global annihilation through nuclear warfare, the U.S. military believed that a nuclear war would actually be more limited and that the Soviets would seek first to neutralize American defensive power. Most command and control centers had been placed, therefore, far from large population centers; few were as important as SAC, located in Offutt, Nebraska. If the Soviets did decide to attack the United States, wisdom suggested they would send their bombers over the North Pole, giving the U.S. leadership just one hour's notice. With the development of intercontinental ballistic missiles, or ICBMs, in the late 1950s, lead-time was reduced to just 15 minutes. In that span of time, a Soviet ICBM could eliminate the ground center at SAC. It was clear that some response to such a scenario must be developed. Looking Glass at work. This mirror operation of SAC ground control went into service on February 3, 1961, aboard an EC-135, which had the frame of a Boeing 707 loaded with state-of-the-art communications equipment. Each member of the 24-man crew, composed of personnel from all branches of the armed services, had a specific role. Among these were the positions of airborne launch control officer, emergency actions non-commissioned officer, and force status non-commissioned officer. At the lead was a commander, assisted by an integrated operations plan advisor, who advised the commander regarding the war plans available to the president. Over the years that followed, Looking Glass pursued its mission, one as grim—based as it was on a doomsday scenario—as it was necessary. During that time, one Looking Glass craft was always in the air, night and day, while at least one more waited on the ground, fully manned and prepared to take over. Over the course of 29 years of nonstop flying, Looking Glass crews accumulated more than 281,000 accident-free hours aloft. Post Cold-War changes. On July 24, 1990, with the Berlin Wall a memory and the Soviet Union fast receding from the world stage, Looking Glass ended its continuous airborne alert mission. Thenceforth, the system would make use of fewer planes, which operated on an alert status—ready to fly at a moment's notice, but not necessarily aloft at all times. Further changes followed. In 1992, SAC was disestablished and replaced by the United States Strategic Command (USSTRATCOM), and Looking Glass became a joint military operation. Then in 1998 EC-135 planes were retired and replaced by the newer E-6B, known as the "Take Charge and Move Out" (TACAMO) aircraft. Also based on the 707 airframe, the E-6B accommodated a crew of 15 or more. Healy, Melissa. "Doomsday Plane's Round-the-Clock Flights Called Off." Los Angeles Times. (July 28, 1990): 2. "Looking Glass Gets a Rest at Last." Chicago Tribune. (July 29, 1990): 2. E-6B Airborne Command Post (ABNCP). U.S. Strategic Command. < http://www.stratcom.af.mil/factsheetshtml/ABNCP.htm > (April 3, 2003). EC-135, Looking Glass. Federation of American Scientists. < http://www.fas.org/nuke/guide/usa/c31i/ec-135.htm > (April 3, 2003). Looking Glass. Nebraska Studies.org. < http://www.nebraskastudies.org/0900/stories/0901_0124.html > (April 3, 2003). 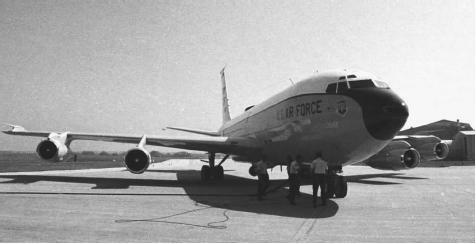 The last of the EC-135 planes used for the Looking Glass mission from 1961 to 1998 taxies to its retirement ceremony at Offutt Air Force Base in Nebraska. In 1998, the Looking Glass mission began using the newer E-6B plane.